The international business environment is rapidly changing and a different market reality is emerging. As a student of today and manager of the future, you need to adapt and adopt flexible patterns of thinking and behaviour to succeed as global manager of tomorrow. The International Masters in Business Administration (IMBA) has been designed with this in mind, as it explores in detail the nature and implications of the changes in the business environment and provides you with the skills and mindset that will allow you to operate effectively within such an unstable and unpredictable environment. You’ll also be taught to successfully lead the organisations of the future, regardless of sector or country. The programme is designed to meet the needs of contemporary international businesses and blends academic excellence and professional skills, equipping you with marketable skills to operate and excel at strategic level across different sectors and in different countries. The course has a strong emphasis on employability and enhancing employability skills, and will help you develop general communication and inter-personal skills. You will emerge from our International MBA with well-developed powers of analysis, clear perspectives on strategy and strategic thinking, creative problem solving, an entrepreneurial mindset and highly effective communication and research skills - all of which are demanded by employers around the world. Should you wish to start your own business, you will have the opportunity to explore and test your ideas in a supportive environment. The programme has been designed to provide graduates with expertise in strategy, marketing, leadership, finance, global human resource management, international business, entrepreneurship, operations and project management, and research skills. You become part of the international community while on the programme, as you will study with students from different parts of the globe. Through our links with industry, the learning experience takes you from the classroom to the factory floor, through sponsored study/field trips to companies in the region, and with our organised internship programme, you have the opportunity to gain valuable work experience while you study. You could have the chance to gain invaluable practical work experience through an ‘In-company’ internship project, an 8-week project based in a UK company. You have opportunities to go on field trips to world renowned companies as part of your learning experience. You will learn from highly experienced lecturers who have industry experience and are specialists in their fields. We will help you with your future employability by offering essential training in key areas such as CV writing, presentation skills, interview technique and other essential skills demanded by employers. You will develop a global perspective of management as you study and share experiences with students from different parts of the world. Join us for lunch to find out more about our MBAs and postgraduate Management degrees, and how you can either continue your studies to take you to the next level or become an expert in a new field. This course differs in content from the International MBA course taught with our partners at the NEXT Campus in Sri Lanka. Full details. While work experience would be an added advantage, no prior work experience is required to be eligible for entry into the MBA International programme. A minimum 2.2 Honours degree from a British university or equivalent overseas institution in any subject. Third Class Honours or Ordinary degrees may be considered on a case-by-case basis. A professional qualification at graduate level in an appropriate field of study. A pre-masters programme approved by Birmingham City University. In recognition that you may already have a relevant professional qualification, Accreditation of Prior Experiential Learning (APEL) may be accepted for entry on to the course. Exemptions to individual modules and / or stages may also be given on a case by case basis. In some cases, students may be admitted into the next level such as Postgraduate Diploma. If you are a mature student but do not fulfil the standard entry requirements outlined above, your application will also be considered. Applicants should provide one academic reference in support of their application to the Master of Business Administration International course and may be subject to interview. Each module is delivered weekly over a period of 12 weeks. Each weekly session typically consists of a one-hour knowledge cast session led by the tutor, a one-hour seminar session, where the topic will be explored in-depth, and two hours of various other activities such as group activities and/or workshop sessions, directed self-study and presentations. You will be assigned a personal tutor, who will be able to review and discuss your progress and offer advice throughout your studies. We use audio visual materials in a range of ways to bring the curriculum to life. Learning and assessment reflect an action learning approach focused on team work, case studies, simulated real-business projects, all of which are underpinned by analysis, evaluation and synthesis. With our Virtual Learning Environment (VLE), you are able to access lecture notes and other resources from anywhere and anytime via Moodle. Each learning outcome is only assessed once and a variety of assessment methods are used throughout the MBA. These include coursework, portfolios, group work, presentations, projects and exams. In addition to summative assessments, we use a variety of ways throughout each semester to provide formative assessments, all meant to support your development and prepare you for formal assessment. Even while she was studying a Diploma in Management Studies and an MBA at Birmingham City Business School, Tina Swani knew that she wanted to work in an environment where people matter and where she could apply the principles of business. She is now the CEO of Birmingham St Mary’s Hospice which, since its launch in 1979, has cared for tens of thousands of people with conditions such as cancer, motor neurone disease, heart disease and multiple sclerosis. My diploma and MBA were instrumental in me getting to the position I’m in now. Many charity CEOs have an MBA or an MSc because the demands of the role require someone with clarity of strategic vision and an ability to work with people. The International Master of Business Administration course at Birmingham City University gave me a far-reaching view of how the business world works in a variety of settings. The comprehensive modules give students wide-ranging breadth across numerous functions. The professors are extremely knowledgeable and motivated to give their students an understanding of their own fields of expertise, and the course material is applicable to a large variety of industries. Our on-site visits to several companies gave students hands-on experience in real-world situations. Working in teams with students from a variety of international backgrounds gave me an extremely valuable understanding about the benefits of working on teams comprised of members with varying circumstances and experiences. The International MBA program at BCU gave me a new perspective on the business world that I have been able to successfully utilize in my professional endeavours since completing the program. There are opportunities for you to further your studies through our research degrees, such as a PhD or the DBA professional doctorate. Before coming to Birmingham from Nigeria, Ibiboba had no notion of what to expect. All she knew was that it was a famous place, maybe because of Aston Villa Football Club. So far, the course has been interesting. We have examined areas like leading and managing people, leading and managing change, international management, process management, international marketing, and entrepreneurship. These courses give you a first hand glimpse of what to expect when you go to work in other countries, what to prepare for, human resource issues, expatriate issues and marketing issues. Unlike undergraduate degrees, which are designed to get students into industry, our International MBA is aimed at both existing industry professionals looking to climb further up the career ladder and aspiring managers with little or no experience. Companies around the world are now looking for a different kind of manager. They need people with different skillsets that can look at situations and opportunities in unique ways. Our International MBA will give you the tools to stand out from the rest. Upon completion, you will be able to effect positive change, both in your own professional practice, and within your organisation. On a personal level, you’ll be able to utilise new skills and methods to improve your efficiency, your critical engagement, and your ability to instigate change. Successful improvements in your personal professional practice will then benefit your organisation. The MBA degree alone can open doors, but the possibilities opened to you by utilising your skills to improve your organisation are even more impressive. Already a managing director, in charge of your own company? The MBA degree can still benefit you internally and externally. The knowledge and skills you will pick up over the course of your degree can allow you to become an industry leader, growing your company’s reputation through innovation. The accompanying benefits of this could help cement your company’s industry position for years to come. 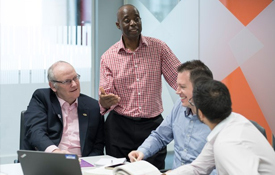 If you want to learn more about how the International MBA degree from Birmingham City Business School could help improve your career prospects, contact Tom Domboka. We equip our students with contemporary, cutting-edge knowledge and skills, so they can enter managerial positions comfortably and professionally. Past graduates have moved on to work with established companies including Service Birmingham Ltd, UN Ltd and Sandwell Council, working as housing managers and operations managers. Tom comes from a strong entrepreneurial and management background with experience in starting new businesses, having worked with a variety of organisations in the UK and overseas. He is now the Director for the International MBA programme. Professor of Marketing Hatem El-Gohary has over 20 years of experience in academia, and was recently one of the winners at the Institute for Small Business Enterprise Awards 2014, taking home the Gold award in the Creative Industries Entrepreneurship category. Having graduated from the University of Manchester in 1984 with a degree in management, Dr McCabe spent time in industry as a management trainee before commencing an EPSRC research-sponsored MSc in Management at Birmingham University in 1988.